Soup season continues! While I’ve made many creamy cauliflower soups before, this time, I have a special guest ingredient that I’ve yet to use here on the blog: celery root! I had never cooked with celery root prior to this fall, probably because I never saw it at the farmers markets in Austin. That’s been part of the fun of moving somewhere new – new city, new vegetables. Celery root has a wonderful, savory celery-like flavor and a creamy consistency when blended. For this soup, I combined it with roasted cauliflower, sautéed mushrooms, leeks, thyme, Dijon, and a pop of lemon at the end. 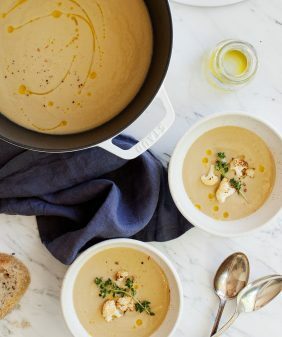 This creamy celery root and cauliflower soup is winter comfort food at its best! Serve it with crusty bread or crispy croutons. I also sautéed a few mushrooms to put on top, but you’ll see in the recipe below that all of these garnishes are optional. You can keep this simple, or make it fancy. You can also make it ahead and store it in the fridge, or freeze your leftovers (I like these glass containers) to save for a day when it’s too cold to leave the house. 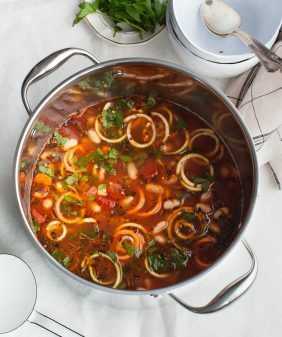 For more cozy soups, take a peek at the soup section of our recipe index! 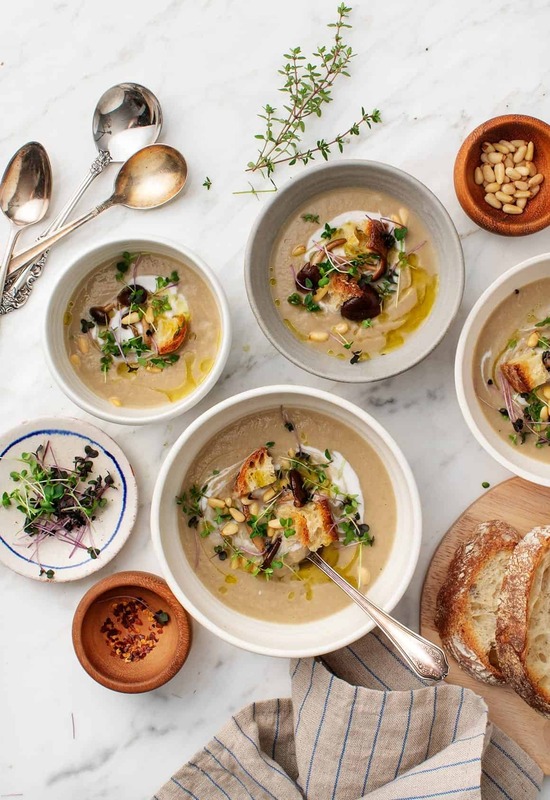 This, cozy, creamy celery root cauliflower soup is winter comfort food at its best! It's healthy, it's vegan, and it freezes well! Preheat the oven to 400°F and line a large baking sheet with parchment paper. Toss the cauliflower with drizzles of olive oil and sprinkles of salt and pepper. Spread evenly onto the baking sheet and roast for 25 to 30 minutes or until golden brown around the edges. Heat 1 tablespoon oil in a large pot over medium heat. Add the leeks, ½ teaspoon salt, and a few grinds of pepper and cook, stirring until soft, about 5 minutes. Add the celery root and mushrooms and cook until the mushrooms are soft, 8 to 10 minutes, turning down the heat as needed. Stir in the garlic, then the white wine. Let the wine cook down for 30 seconds and then add the broth and thyme. Cover and simmer 20 to 30 minutes, or until the celery root is fork tender. Let the soup cool slightly, then transfer to a blender. Add the roasted cauliflower and blend until smooth. Add the lemon juice and Dijon mustard and blend again. Taste and adjust seasonings, adding additional lemon juice if you would like more pop. If the soup becomes too thick, add water to thin to your desired consistency. Serve with desired toppings, generous drizzles of olive oil, and crusty bread. 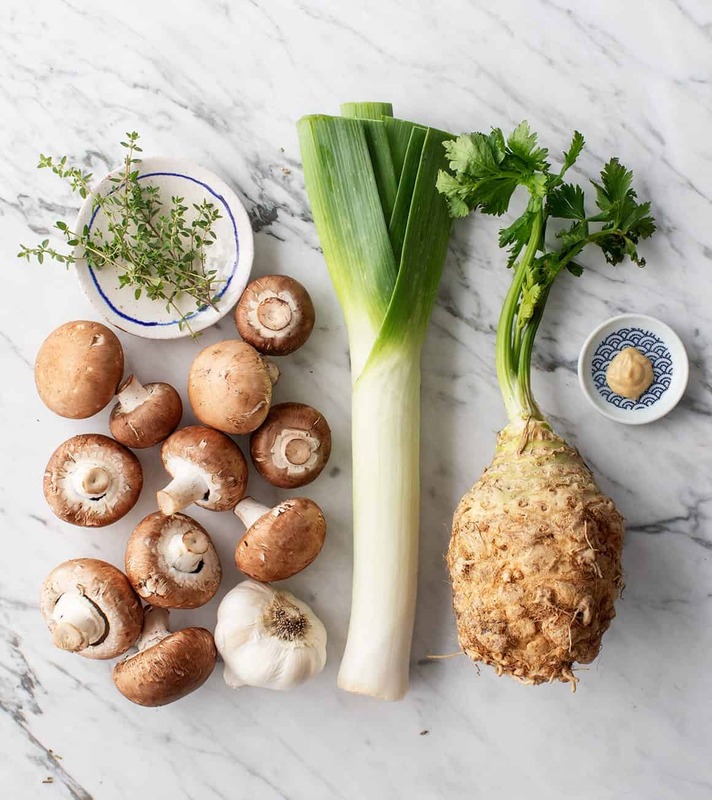 *This soup can be made with roasted cauliflower instead of celery root. Use 2 chopped celery stalks in place of the celery root in Step 2. Add roasted cauliflower from a small 1-pound cauliflower to the blender in Step 4. (Roast florets at 400°F with drizzles of olive oil for 30 minutes or until tender). Season to taste with about ¼ teaspoon more salt and extra squeezes of lemon since cauliflower has less concentrated flavor than celery root. This cauliflower version yields a bit more soup than the celery root version listed above. My gf and her son both got sick a few days ago and she told me they’re basically surviving off of soup! I just texted her the link to this recipe because I know she’ll love this, thank you!!! Celery root is readily available in France. My favorite way to eat it is still has a grated salad, tossed with a mustardy vinaigrette, and parsley. It is also good mashed with potatoes. I enjoy your recipes very much, along with your photography. I bought your cookbook for my daughter. as a salad, sorry for the typo. Growing up in Germany made me appreciate celery roots; either as a salad or in mashed potatoes. So delicious yet so simple. 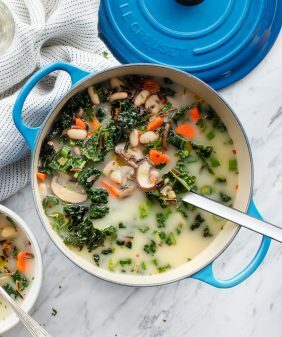 Oooh, this cozy creamy soup looks amazing! nice dish, celery root! 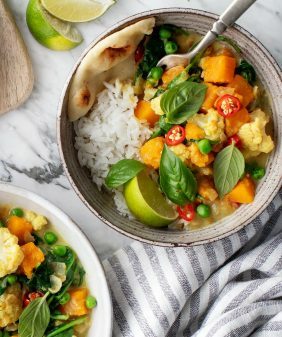 Yea, and great way to get a daily or other dose of cauliflower if you just can’t bear to eat it raw regularly, since it’s one of my regular diet ingredients, so thank you for a wonderful soup! 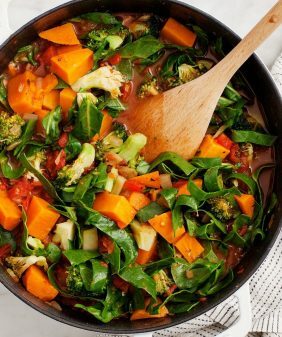 Healthy, vegan recipe, delicious soup! I think we call this ingredient celeriac. Maybe you can confirm that it is the same thing. I’ve never heard of celery root before.